This bone carving is a Manaia called 'Turned Within'. Through being enclosed in the protection of the circle, this Manaia is able to look deep inside itself to understand the purpose of life and determine a clear direction that is meaningful. This is represented by the Manaia being on the inside of the carving and looking towards the carved details of the various Koru. A Manaia is a symbol of spiritual protection. The Manaia, or spiritual guardian, is the profile of a Tiki. This is symbolic of being half in this world and half in the spirit world. Manaia can be adapted with other symbols and stylized to communicate different aspects, or meanings. This Manaia is called 'Turned Within'. 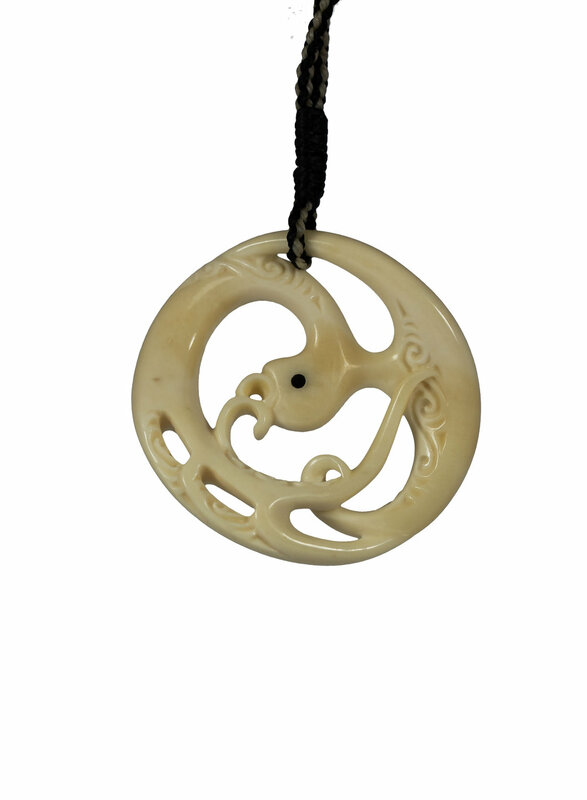 Through being enclosed in the protection of the circle, this Manaia can look deep inside itself to understand the purpose of life and determine a clear direction that is meaningful. This is symbolised by the Manaia being on the inside of the carving and looking towards the carved details of the various Koru. The eye is an inlay of buffalo horn. This is symbolic of strength and protection, as the horns protect the buffalo from harm and serve to keep open space around it. The wing and tail interlock with itself which represents trusting oneself. Deep inside ourselves we have the strength and answers we all need.